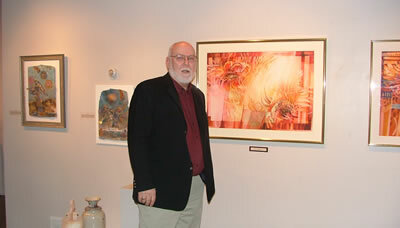 Theodore W. Vassar has taught art at Monroe County Community College for the past thirty-seven years. He is an award winning transparent watercolorist and water-media artist whose paintings have been selected for exhibit in juried national, regional, state and local art exhibitions. Ted’s paintings are represented in numerous institutional, corporate and private collections. He is a member of Northwest Ohio Watercolor Society, Toledo Artist Club, Lenawee Council for the Visual Arts and the Ohio Watercolor Society. Ted was elected to the O.W.S. Board of Trustees (1999-2004) and elected President of the Ohio Watercolor Society in 2004. He also served as the Exhibition Chair for the O.W.S. Watercolor Ohio 2004 Juried Exhibition. He has juried many local and state art exhibitions, given watercolor workshops and has served as a presenter and demonstrator at the OWS NATIONAL CREATIVITY SEMINAR, Stretching Boundaries for Creative People IV and V, 2000 & 2002.